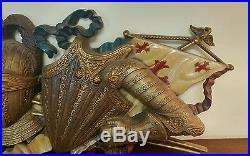 Really awesome Vintage Plastic Wall Decor. Perfect for your Game of Thrones Themed room! 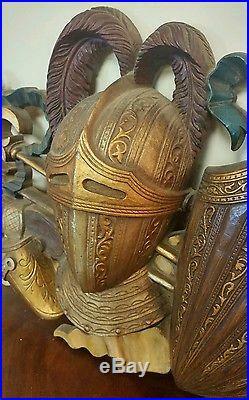 (this is not a Game of Thrones item but just fits in great with that style) Great Knight mask with an eagle, sword, Coat of Arms, Shield and more! May need to be cleaned. Approx measurements are: 35" long x 12" wide x 5 deep. 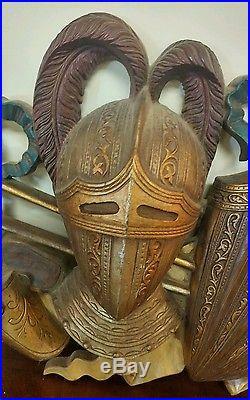 The item "VTG 1970 Burwood Products #9062 Knight Coat of Arms Wall Plaque Game of Thrones" is in sale since Monday, July 03, 2017. 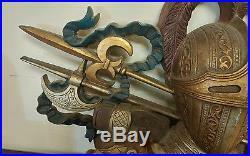 This item is in the category "Collectibles\Decorative Collectibles\Decorative Collectible Brands\HOMCO\Other HOMCO". 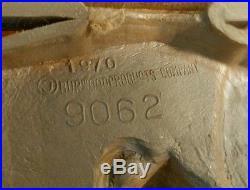 The seller is "dts718" and is located in Portsmouth, New Hampshire. This item can be shipped to United States, Canada, United Kingdom, Denmark, Romania, Slovakia, Bulgaria, Czech republic, Finland, Hungary, Latvia, Lithuania, Malta, Estonia, Australia, Greece, Portugal, Cyprus, Slovenia, Japan, China, Sweden, South Korea, Indonesia, Taiwan, South africa, Thailand, Belgium, France, Hong Kong, Ireland, Netherlands, Poland, Spain, Italy, Germany, Austria, Russian federation, Israel, Mexico, New Zealand, Philippines, Singapore, Switzerland, Norway, Saudi arabia, Ukraine, United arab emirates, Qatar, Kuwait, Bahrain, Croatia, Malaysia, Brazil, Chile, Colombia, Costa rica, Dominican republic, Panama, Trinidad and tobago, Guatemala, El salvador, Honduras, Jamaica, Antigua and barbuda, Aruba, Belize, Dominica, Grenada, Saint kitts and nevis, Saint lucia, Montserrat, Turks and caicos islands, Barbados, Bangladesh, Bermuda, Brunei darussalam, Bolivia, Ecuador, Egypt, French guiana, Guernsey, Gibraltar, Guadeloupe, Iceland, Jersey, Jordan, Cambodia, Cayman islands, Liechtenstein, Sri lanka, Luxembourg, Monaco, Macao, Martinique, Maldives, Nicaragua, Oman, Peru, Pakistan, Paraguay, Reunion. Size: 35" x 12" x 5"